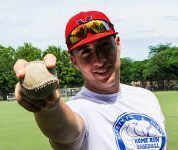 Brian has been with Home Run Baseball Camp since it’s inception in Brooklyn in 2010. He was one of Coach McCarthy’s first hires. Brian is a respected community leader among players, parents and his coaching peers. Brian, a Brooklyn native, graduated from James Madison High School and then Queens College where he captained both baseball teams. He teaches Health & Physical Education, and is also the Athletic Director and Varsity Baseball Coach at Millennium Brooklyn High School which is an academically competitive, screened school in Park Slope, Brooklyn. Brian has a Bachelors Degree in Physical Education, a Masters Degree in Sports Management, and an Advanced Certificate in Disaster Management. He also has extensive experience in teaching and supporting students with special needs, especially children with Autism Spectrum Disorders. Brian is an avid reader, which comes as no surprise as his wife Samantha, is a High School English teacher. She is also one of the lead on site administrators for our camp in Brooklyn. They have traveled several times with Home Run Baseball Camp’s Family trip to the Dominican Republic in February. They reside together in Park Slope.